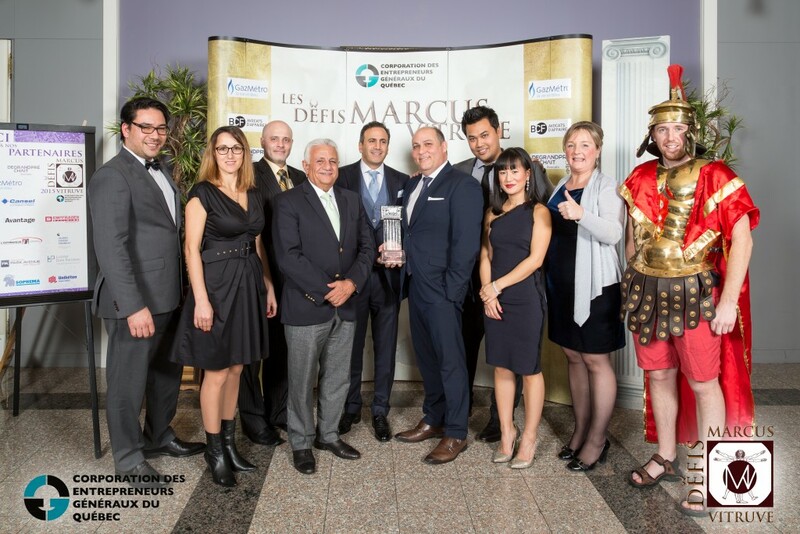 On November 19th, 2015, yook place the second edition of Marcus Vitruve Challenges organized by CEGQ, This year, the event was held at Riviera Reception Hall, located in Anjou. Marcus Vitruve Challenges were to recognize the excellence, enhance the recognition and understanding our industry. For this 2nd Edition, we could count 10 different categories of challenges separated into two intervals depending on the value of the projects, either lower or higher than 10M$. Groupe Module Construction had submitted its applications in 4 distinct challenges has been nominated in all of them – PHI Center “Espace Plateau” for the technical and technological challenge under 10M$ and the sustainable building challenge under 10M$ as well as the 215 Redfern Condominiums for the renovation challenge above 10M$ and finally, the business succession challenge. Groupe Module Construction was awarded for the renovation challenge above 10M$ for its project at 215 Redfern. The renovation award was won with pride by Module team that continues its commitment to excel in this field by always being ready to face other unique challenges.